Comixology announced that it would be giving away almost 700 free issues at the South by Southwest conference in Austin. In the last 48 hours since the comics have been available, the company’s systems have been crashing and many customers are unable to even log into the system. This normally wouldn’t be a big problem, but the free #1 issues are only available until March 12th 2013, which means the vast majority of comic lovers won’t be able to download anything at all. 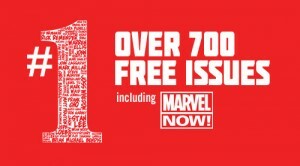 The main idea behind the free first issues will be to encourage people to buy second issues. Most of the comics available are older, but you can find some great things if you can get to them. We have found through our own experiences that the app suffers the most on iOS and Android. The best solution is to directly access the webpage, get the goods from there, and it will then be automatically synced to your account. Unfortunately, due to the demand the company has paused the ability to download all the free issues, with no word on when they will reinstate it again. I can’t even download issues that I have paid for!